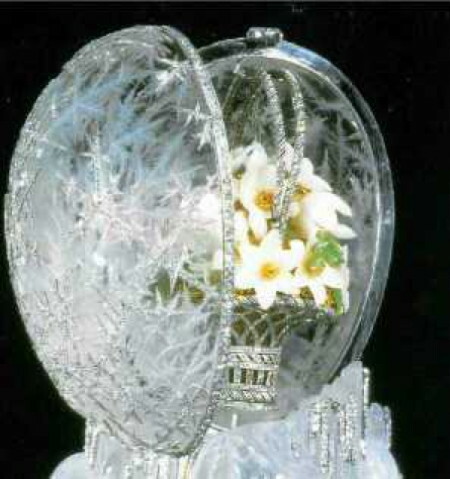 On a rock-crystal base formed as a block of melting ice, applied with platinum-mounted rose-diamond rivulets, the hinged rock-crystal detachable egg held vertically above by a pin and with rose-diamond set platinum borders, graduated around the hinge and enclosing in the top a cabochon moonstone painted on the reverse with the date 1913, the thinly carved transparent body of the egg finely engraved on the interior to simulate ice crystals, the outside further engraved and applied in carved channels with similar rose-diamond set platinum motifs, opening vertically. The Winter Egg was the most expensive egg - it costed just under 25,000 rubles, or about $12,500 (of 1913). 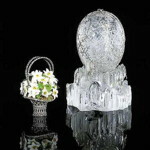 The Winter Egg was in 1927 one of the nine Imperial Eggs sold by the Antikvariat to Emanuel snowman of Wartski, London. 1934 sold to lord Alington, London. 1935 Owner anonym. 1848 owned by the late Sir Bernard Eckstein, UK. 1949 sold by Sotheby's London to a. bryan Ledbrook, UK. Disappeared around 1975 after Mr. Ledbrook died. 1994 located in a London safe. November 1994 sold by Christie's Geneva on behalf of a trust to a telephone bidder, acting for a US buyer. 2002 sold by Christie's New York to a bidder acting for the Emir of Qatar. The surprise is a platinum double-handled trelliswork basket, set with rose-diamonds and full of wood anemones, suspended from a platinum hook, each flower realistically carved from a single piece of white quartz with gold wire stem and stamens, the centre set with a demantoid garnet, some carved half open or in a bud, the leaves delicately carved in nephrite, emerging from a bed of gold moss, the base of the basket engraved in Roman letters "Fabergé 1913".